We recommend checking out our discussion threads on the GEKO E100 1080p Dash Camera with DVR E1008G, which address similar problems with connecting and setting up Dashcams GEKO. The user manual for the GEKO E100 1080p Dash Camera with DVR E1008G provides necessary instructions for the proper use of the product Surveillance - Vehicle Cameras & GPS Tracking - Dashcams. 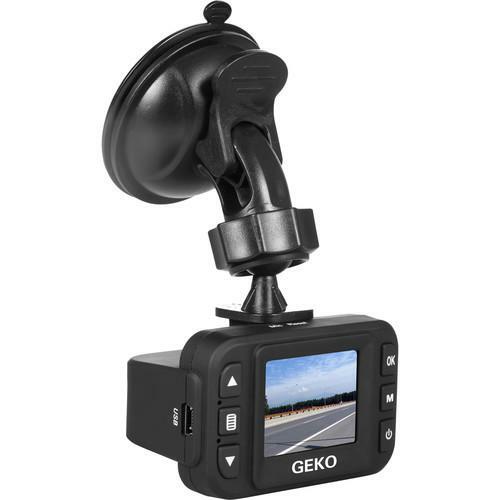 View and record activity outside of your vehicle using the E100 1080p Dash Camera from Geko. The camera features 1080p resolution at 30 fps for high-quality video and a 1.5" color LCD display, allowing you to easily view what the camera will be recording. Mount the camera to your windshield using the included suction cup mount and capture a broad vista of activity with the 120° wide-angle lens. With the ability to flip the screen orientation, you can also mount the dash camera to your car's dashboard using a dashbag (available separately). A pre-installed adjustable EV value system monitors ambient lighting and alters the dashcam's exposure value for constant high-quality video in bright or dark situations. A microSD slot supports cards from 2GB to 32GB for recording footage, and the camera includes an 8GB microSD card for immediate use. When using a 32GB microSD card, the camera can record approximately five hours of video at 1080p resolution. The dash cam will automatically record in a continuous loop for convenient hands-free use and features a G-sensor and motion sensor for triggering write-protected recording when motion, impact, sharp turns, or drastic braking are detected. The camera also offers a parking monitor which uses a backup battery to record detected motion when the car is turned off. Durable construction with a heat-resistant lens enables the camera to withstand harsh weather conditions and a large range of temperatures. If you own a GEKO dashcams and have a user manual in electronic form, you can upload it to this website using the link on the right side of the screen. Box Dimensions (LxWxH) 5.6 x 4.6 x 3.6"
The user manual for the GEKO E100 1080p Dash Camera with DVR E1008G can be downloaded in .pdf format if it did not come with your new dashcams, although the seller is required to supply one. It is also quite common that customers throw out the user manual with the box, or put the CD away somewhere and then can’t find it. That’s why we and other GEKO users keep a unique electronic library for GEKO dashcamss, where you can use our link to download the user manual for the GEKO E100 1080p Dash Camera with DVR E1008G. The user manual lists all of the functions of the GEKO E100 1080p Dash Camera with DVR E1008G, all the basic and advanced features and tells you how to use the dashcams. The manual also provides troubleshooting for common problems. Even greater detail is provided by the service manual, which is not typically shipped with the product, but which can often be downloaded from GEKO service. If you want to help expand our database, you can upload a link to this website to download a user manual or service manual, ideally in .pdf format. These pages are created by you – users of the GEKO E100 1080p Dash Camera with DVR E1008G. User manuals are also available on the GEKO website under Surveillance - Vehicle Cameras & GPS Tracking - Dashcams.